We’ve just won the Red Dot Award: Product Design 2019 for the Oblong Optical Wand and we couldn’t be more thrilled. The wand is an expression of our spatial computing philosophy and human-centered design approach to both hardware and software at Oblong Industries. To meet the greater levels of productivity demanded by our complex business world, we’re reimagining how we interface with our computing environments entirely. The type of interactivity overhaul that we bring to life bridges the chasm inherent to two dimensional, flat interfaces through interactivity with motion and space. Hand-in-hand with taking UI design to the next level are the hardware systems and platforms that make gestures like swiping, pointing, and clicking so intuitive and effortless. More capable input and control devices are critical in enabling users to take charge of the data-centric future of work. 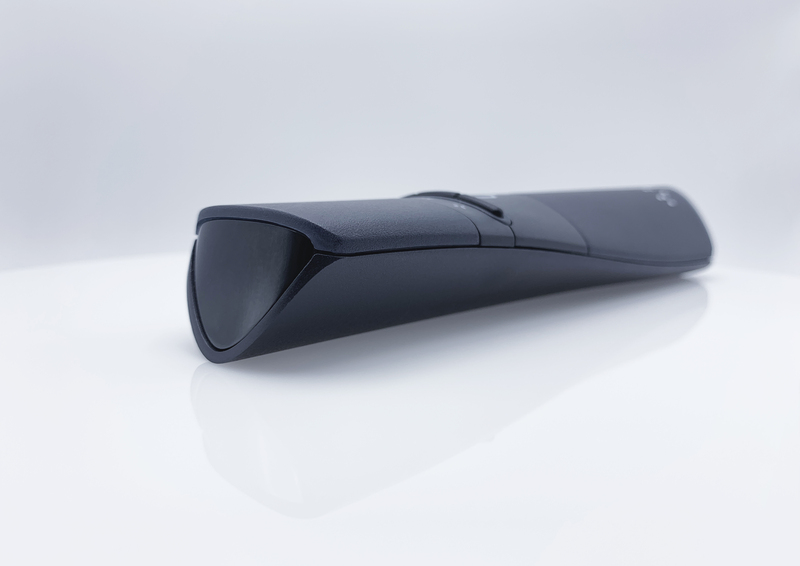 The Oblong Optical Wand is designed to empower users to collaborate in a fully capable, yet intuitive way. The wand is the first hand-held device of its kind that allows knowledge workers to break free of the confines of working in two dimensional digital space. Oblong continues to be at the forefront of spatial and gestural interfaces. The wand is a handheld device used to interact with and manipulate data-rich and highly visual digital content in immersive display environments. By tracking the wand position in three dimensional space, users intuitively use gestures and motion to engage directly with displayed content. 1. Introduce users to a novel interface that incorporates three dimensional space and gestures. 2. Keep the hardware footprint as minimal yet robust and flexible as possible. With human-centered design principles at our core, user experience and ease of use were carefully considered at every critical user touchpoint. 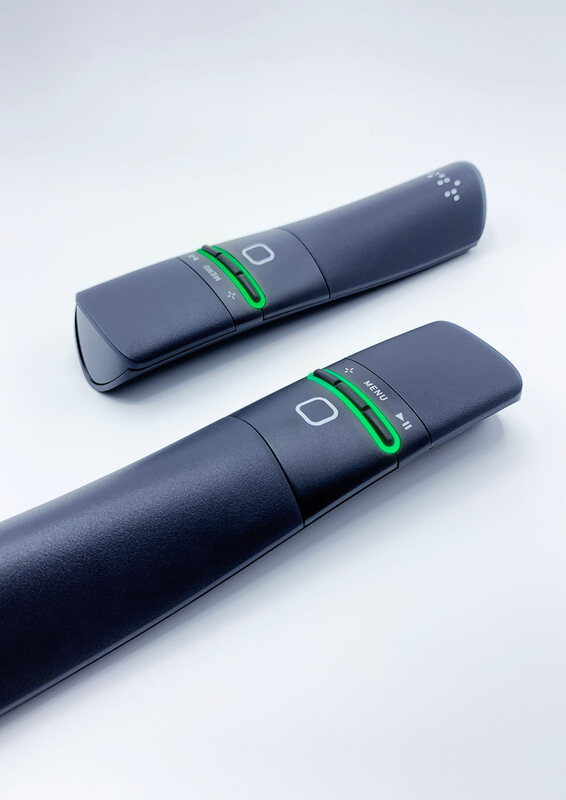 The underlying technology for the Oblong Optical Wand was made invisible to the user and each feature and function was strategically pared down to help guide users through actions and tasks. The Oblong Optical Wand is the gateway for spatial control. Inspired by undulating spline curves and triangles, the wand shape is effortlessly unique. The weight balance and curvature of the wand body nests comfortably in the user's hand. A minimal 4 button and touchpad interface layout provides the user with full control without distracting from the content on screen. Our hardware footprint was designed to blend seamlessly into room environments without sacrificing functionality. The wand tracking ecosystem includes a pattern of infrared beacon components that are quickly and discreetly mounted around display areas. An optical sensor embedded within the wand works in real time to visually track these patterns around displays and triangulate the location of displayed content. By bringing to market a simple yet powerful new tool and mode of interaction, users are now empowered to redefine their relationship and ownership over their digital information. The same ease and comfort with which we navigate and physically control space is seamlessly translated to include the digital world in which we now do most of our work. This in turn lowers the technical barriers to user adoption and interacting with computers becomes more user centric and inclusive. As users shift their processes and workflows to think more spatially, new perspectives and deeper insights are now easily accessible. With this truly revolutionary control interface in hand, information is free to move fluidly in three dimensional space rather than in two dimensions. Users now have full view and intuitive control over their disparate and unstructured data and the path is cleared for unexpected and groundbreaking ideas to arise. Technology enhances the flow of communication and ideas instead of being a barrier to it. At Oblong, we designed the wand ecosystem to open boundless three dimensional digital environments for users to share, analyze, understand, and ultimately act on complex data. Learn more about our advanced technologies and flagship Mezzanine product which feature the wand for gesture among the modes of control at Oblong.com.